8:30 am. Daylight came about 6:30 and we arose to get ready for the day. Then we packed some of our things in the three suitcases we will be checking in tomorrow at the airport. I am trying to redistribute the weight so none of the suitcases will be too difficult to lug around at Miami. My carry-on folds down into a compact unit and this went in one of the suitcases. I will pack most of my clothes and only carry my backpack with me. That will only be partially full and that will make it easy to handle on the plane as well as at Miami. This will allow me to have two hands to help with the luggage. Howard will be busy with his carry-on and backpack. We fly into Miami and then will take Jordan to the check in counter to get his boarding pass for his flight from Miami to Charlotte, NC. This morning we had fresh mora juice again. We have had a lot of mora the past two weeks and it is a very tasty fruit. The juice is made from putting the fruit in a blender and making a puree of it. 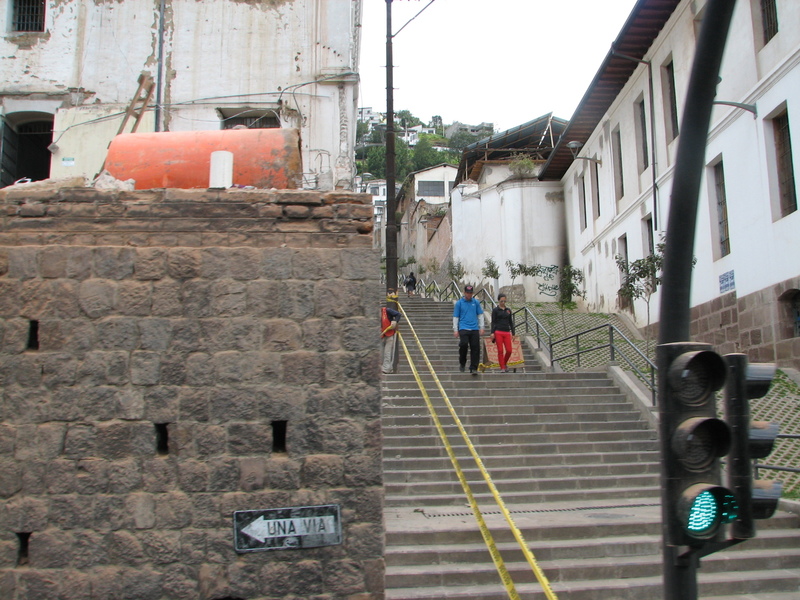 About 9:30 Jane will be coming to pick us up to head to the market here in Quito. 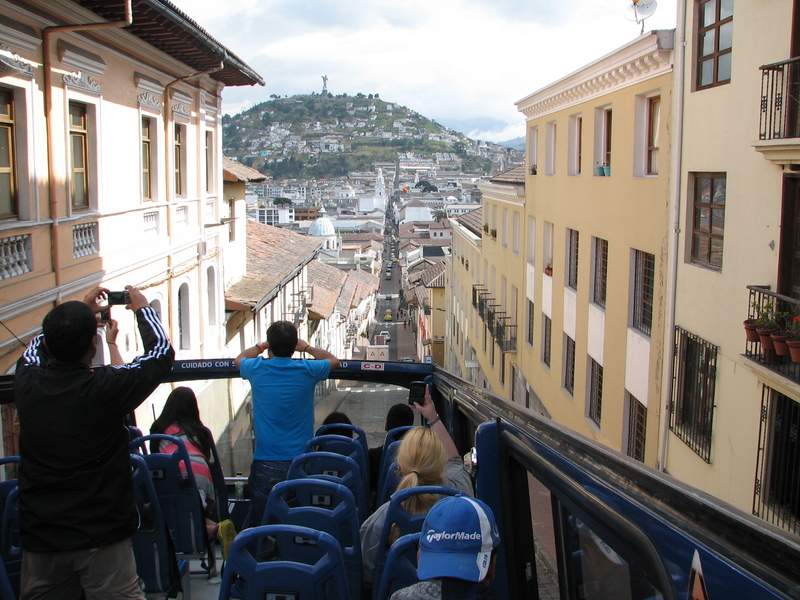 Then we may take a guided tour of Quito before coming back to the guest house. This should be a shorter day for us so we can do our final packing and get some sleep before getting up early to head to the airport. Father, this is our last full day here in Ecuador. Thank You for bringing us here and allowing us to work for You. Thank You for all that You have taught us. Thank You, Lord, for the restful nights. Thank You for the bright sunshine and the beauty of this land that You created. Thank You for bringing Jane into my life and the professional and personal friendship that You orchestrated so we could work together in service to You. Lord, it is a privilege and pleasure to see lives changed because of what You do through us. Thank You, Lord, for that. 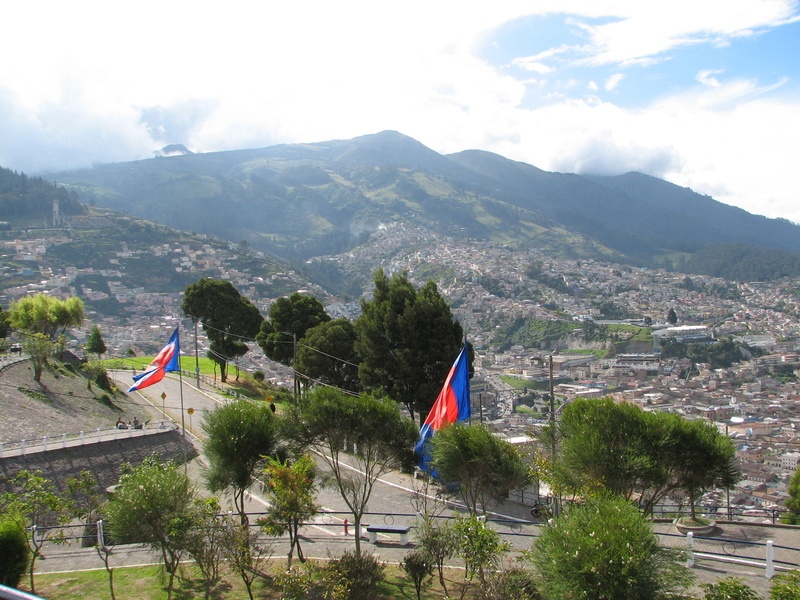 I pray, Lord, for safety today as we travel around Quito. I pray for our day. Show us what You want us to see, Lord. Continue to empower us to serve You. Lord, help keeps us focused on that. Thank You, Father. Amen. Jane arrived by 9:30 and Damarys was with her. 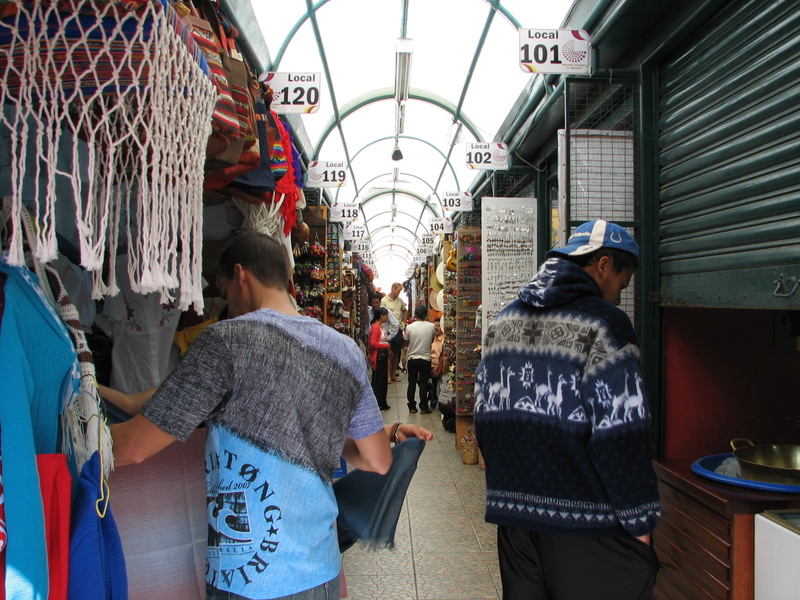 Damarys was driving and she took us to the market in central Quito. 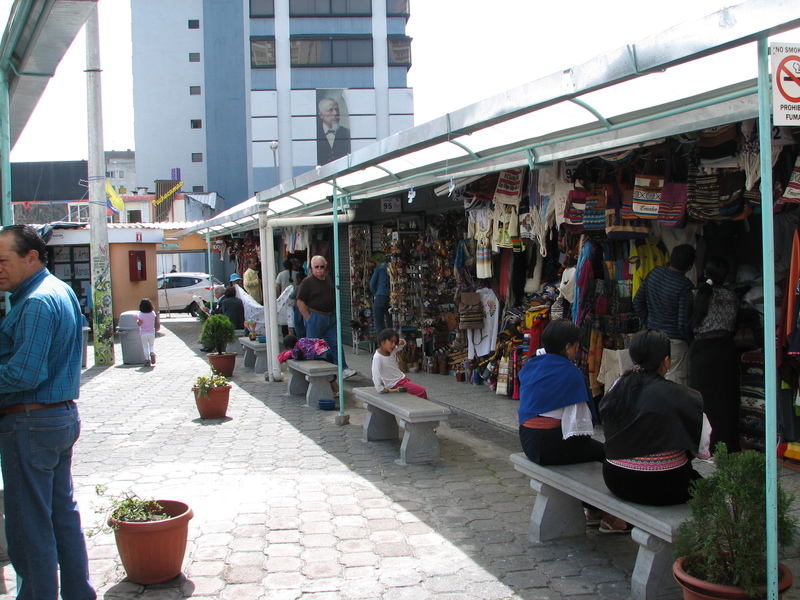 This is another Otavalo. There were rows and rows of vendors with about 4 feet of aisle space for people to go both directions. We were being bumped constantly as we stood and looked or even talked with one of the vendors. There was so much stuff! We walked the market until about noon then Damarys drove us to a large mall where we could park. 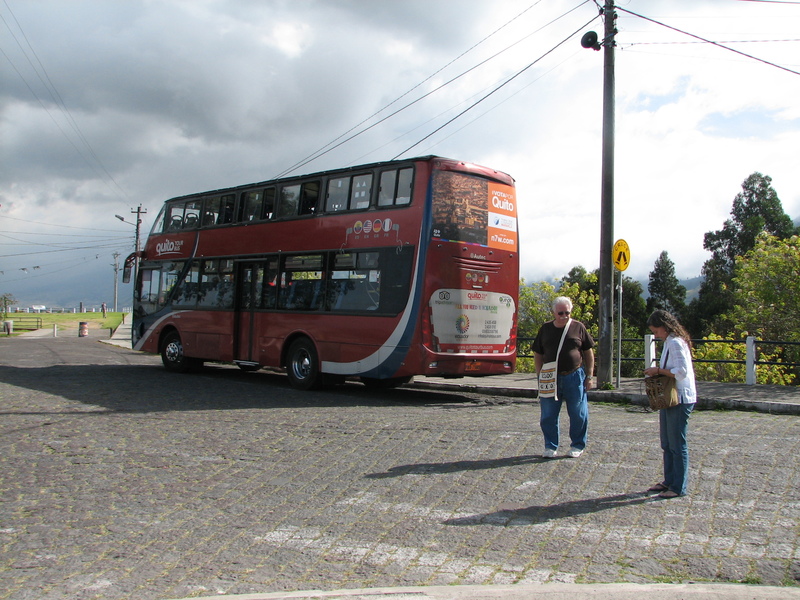 The tour of Quito bus starts there at the mall. So we went into the mall to the food court and had some food and then went down to the ticket counter for the tour and got our tickets. Jordan is shopping. This happens to be a sorbet vendor. One of the wider aisles of the market. We got on the tour bus about 2 pm and enjoyed a 3 hour adventure going through the old city where the streets were so narrow the bus took up the entire street. This was a double decker bus so we sat on the top level. As we went through some of the streets the awnings over the windows came very close to the bus. The tour was narrated in English and Spanish and we learned a lot of history of this city of 2 million plus. Jane was telling me that Quito is 4 miles wide and about 26 miles long. The houses are packed in next to one another with no yards or grass. There were people everywhere. 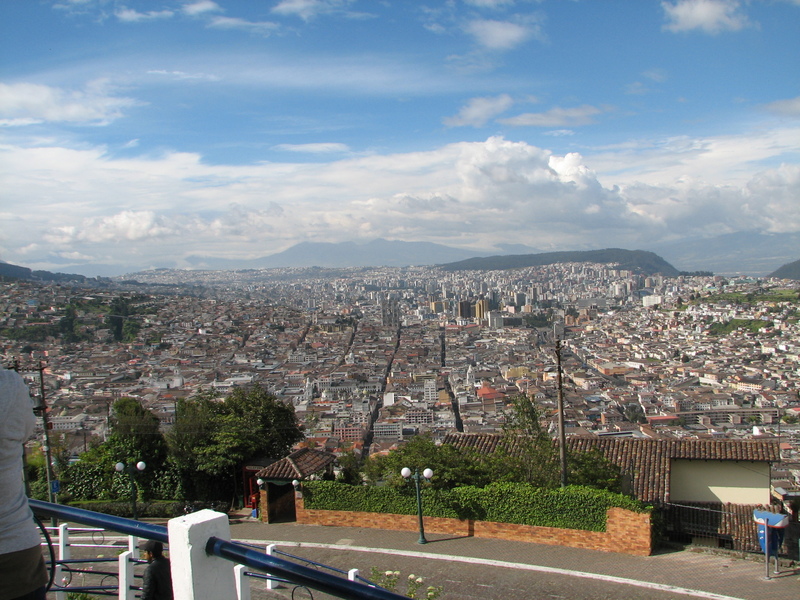 There is no level ground in Quito. We could stand up in the top level of the bus when the roof was pulled back. Modern high rise buildings next to old style buildings. 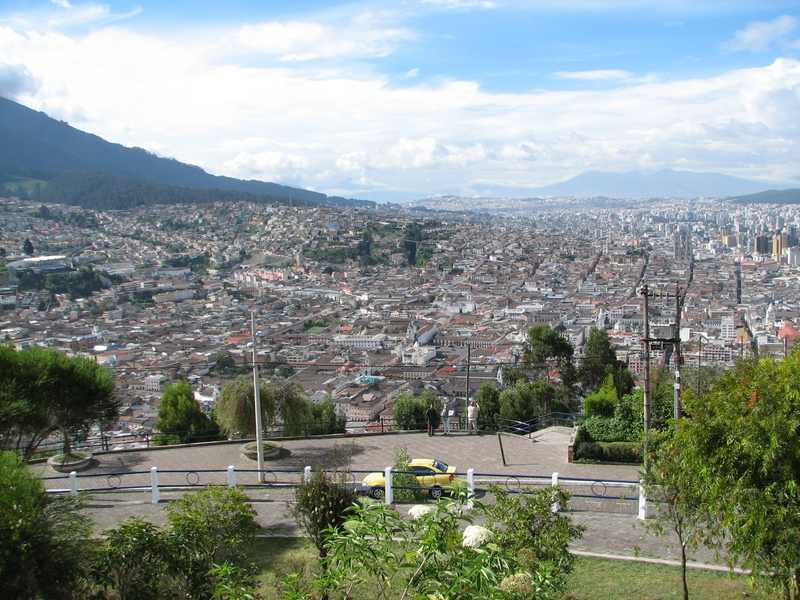 Looking at Quito from the highest point. We arrived back at the mall a little after 5 pm. Then we went back up to the food court to have dinner and then Jane took us to the guesthouse so we could finish packing and get to bed early. Our flight leaves at 8:35 am and we need to be at the airport at least 2 hours ahead of that. Jane is coming at 5 am to get us as the new airport is now an hour’s drive from where we are, if there is no traffic. Jane is allowing and hour and a half so we can be sure to arrive at the airport by 6:30 or before. Now it is time to call it a day and get some sleep. Four am will come too quickly. Father, this has been an interesting day, sort of a down time from the work we were doing. Yet, as we traveled through the market and on the city tour I saw people who were disabled and carrying burdens of their own and though of how You would look upon these people with compassion and love. Lord, Your love is endless and unconditional. I am a recipient of that love and my heart explodes with thanksgiving for that. Lord, I pray for a good night’s sleep for us and for safe travels tomorrow. I know You are with us now and will be with us tomorrow. Thank You for that assurance. I love You and worship You, Lord. Amen.